Sikiru Olatunbosun has emerged the winner of the CNN Goal of the Week taking after his heavenly goal against Rangers International of Enugu, becoming the first Nigeria Professional League (NPFL) player to win the award. Olatubosun got heads turning when he marvelled with his superb strike against Enugu Rangers on Friday night at the Agege Stadium. A nice backheel flick from MFM FC player puts the ball comfortable on his Olatunbosun comfortable feet, he wastes no time and gives it a chance to bounce once before flicking it over Rangers defender and afterwards rifling a long-run volley into the back of the net. 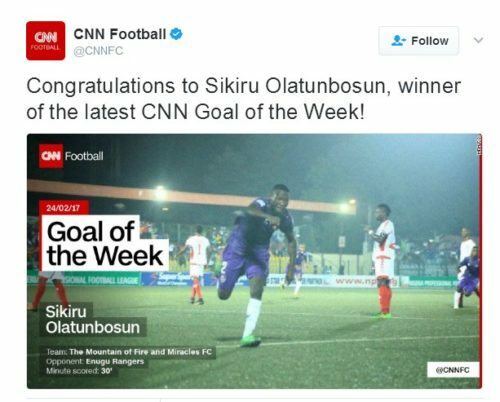 0 Response to " MFM FC Striker, Olatunbosun Wins CNN Goal Of The Week (Watch)"